“Everyone thinks they know about Leonardo da Vinci. We hear all sorts of things about him – from the specious Da Vinci Code to descriptions of him as the perfect Renaissance man, but most of us have a very vague picture of who he really is. 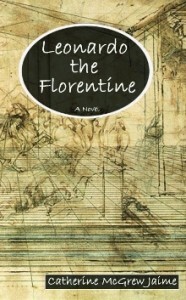 Catherine McGrew Jaime opens a window into the early life of da Vinci in Leonardo the Florentine: A Novel. This novelization of Leonardo’s early life is the first of what Jaime hopes will be many novels about Da Vinci. Catherine Jaime has a gift for story-telling. From the very beginning of the book, you identify with Leonardo and want to keep turning the pages to find out what happens next. I love using accurate historical fiction with our children. Like “a spoon full of sugar makes the medicine go down,” learning history through reading the gripping stories of those who lived it, doesn’t just make history palatable, it makes it unforgetable. More than that, reading biographies gives our children something to aim for. They begin to be able to imagine what the heroes of history would do in different situations – and that is character-building! Jaime’s Leonardo does a great job of showing one of these heroes in a tough situation, as an unknown apprentice with little liberty and less money. Also, Jaime’s description of the Florence of the Medicis is so interesting that it’s likely to provoke a desire to find out more about this influential family and the Florence of the Renaissance. You can definitely tell that the author has been researching and studying the life of da Vinci for years. I believe you and your children will find this novel a great introduction to one of the most fascinating characters of history. It’s full of intrigue and adventure, and gives tantalizing glimpses of the polymath Leonardo da Vinci would become. Highly Recommended. For another review of Leonardo the Florentine, see Carol’s review .